Third day in finds me exploring further afield, my intention is to climb above the tree-line, to get a sense of scale – perspective – on the size of the Trust property on Arran. It’s a lovely day, the sun keeps breaking through, briefly highlighting a gaggle of deer or the glistening trickle of a burn. Stopping to snack on an apple a chap walks past clearly intent on scaling Goatfell whilst swigging from a bottle of beer. If he can do it so can I.
It’s interesting to look down on the tree-line, in the nestle of the Cnocan Burn the transition is soft: rowan and birch give way to bush and shrub before all is heather and scrub; this gradation throws the hard edge of commercial forestry into sharp relief. A line drawn on a map: to here. 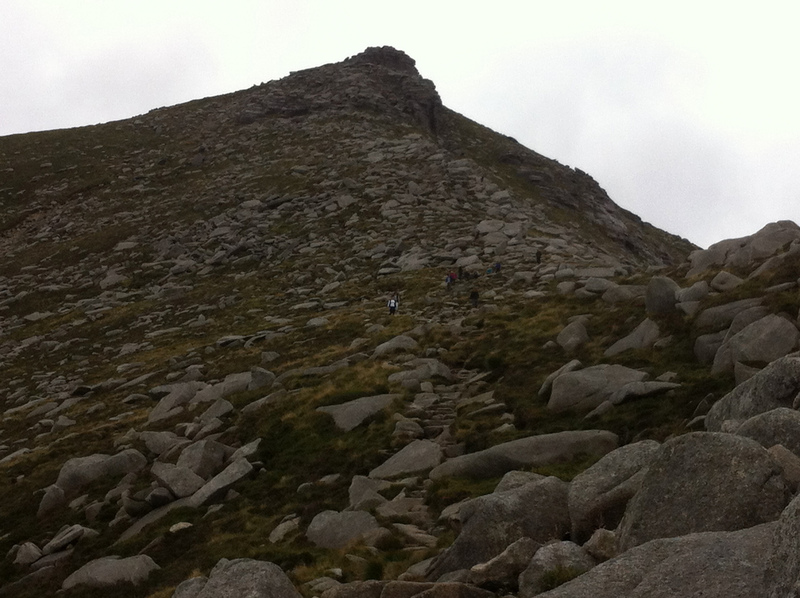 Looking at the map, Goatfell has all the markings of wild land, home of Eagle and Raven, bluff and crag, I take a photo of the rocky back of the ridge I’ll climb and only later spot how many people are in shot:11, all descending. I’ve passed the beer-drinker long ago and it’s pretty late in the day so I’m feeling confident I’ll have the summit to myself; it’s a foolish thought. This entry was posted in Uncategorized and tagged Arran, Brodick, Cnocan Burn, Deer, Forestry Commission, Goatfell, Tree-line. Bookmark the permalink.